Why is this a very DTW car? 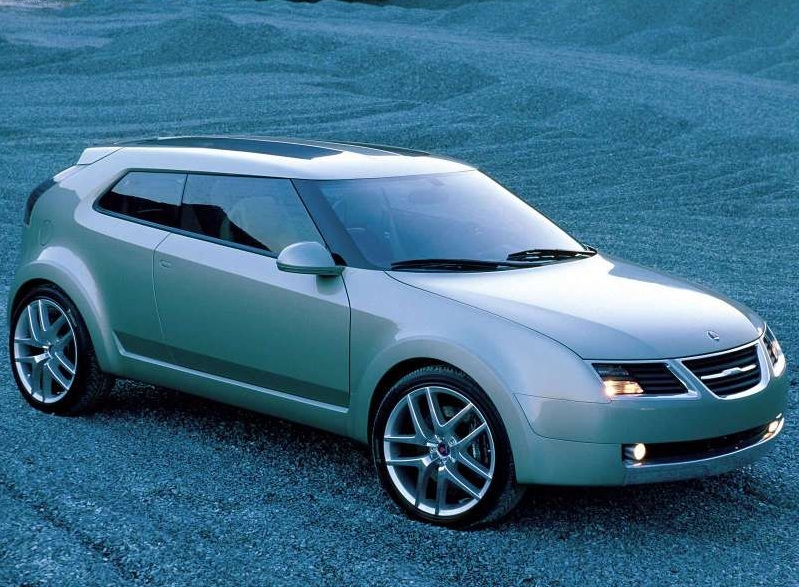 This is a concept car from the year 2002 and has a challenging appearance; it was good enough to deserve production but wasn’t produced; it was a proposal for an extinct and much-missed brand (Saab) and it originated from a now-dead coachbuilder, Bertone. Finally, you can’t help but notice that it is orange. We like orange. You can also find sketches of the interior here though they are not especially revealing, lovely as they are as drawings. That transparent orange structure runs from the centre of the front console rearward and then on back to divide the rear passengers left and right. Most of the controls seem to have been grouped inside the steering “wheel” with some others positioned rather far away on that orange iMac-ish console. Maybe it’s just for mapping and television. SKF who worked on the steering made huge efforts to develop a believable drive-by wire system but this is one of those zombie-ideas that seems not be actionable and yet refuses to die (like “intelligent” fridges and interactive floors). “When compared with the Bertone-SKF Filo, the Novanta demonstrates much-improved steering feedback and feel, as well as improvements in the braking system and transmission interfacing,” they said. it went nowhere – drive-by-wire is still a pipe-dream. The Novanta had no brake or accelerator pedals. The stop, steer and go functions all lived in the hand-controlled interface ahead of the driver, “a smart electro-mechanical actuating unit” as SKF call it. The SKF designers chose to have that assembly mounted to the door; shut the door and the control device would extend from its home and stretch out ahead of the driver. Look at the photo with the model in the driver’s seat. There is no steering column between the controls and bulkhead. In a crash there would be less ahead of you to whack into. I’d call that kind of innovation precisely the kind of thing you’d have expected of Saab. Putting that together with Bertone’s blend of traditional Saab touches and their own original contributions makes aesthetic and marketing sense. Based around the Saab 9-5 mechanicals, the Novanta served also to mark Bertone’s 90th year. More overtly, the decision to make this a packaging car means the requirements of the interior volume takes precedence over the pressure to deploy more conventional proportions on the outside. It is not obviously an attractively proportioned car – and I’d argue it’s the better for it too. It is a proper show car and also one of those insprired by product design norms. Bertone’s designers didn’t consistently follow through in this determination to put function over form. Instead of a being a spacious room for three, the rear compartment is divided by that orange structure – an object whose purpose in life was more metaphorical than useful. A 4.4 metre long family car does not need a ribbon of shiny plastic taking up the space where a person could otherwise sit. Furthermore, the deep shoulder really eats into cabin space. So, what is it: form or function? The rear windscreen is not especially practical but I find its graphic effect worth the trouble. The way the transitional surfaces around the boot and c-pillar work deserve notice. Let’s squint at that bit. I have marked up the edge of the boot with a dark green line; along the very deep shoulder you can see another break, also marked in dark green. Between those is a generous, large transition from the boot’s upper surface to the body side, marked with a folded arrow. I consider that a very creative and more than acceptable solution to unifying those surfaces as a satisfactory whole. As a detail, the ball-corner “B” is just lovely. Is the ball corner the hall-mark of the industrial design form-style, just as double-corners are for the Baroque? Don’t bother Googling that – it seems to be something no-one else has much remarked upon. Stepping a little further back, notice the deep and oh, so simple C-pillar, a third of which is actually the window frame/upper door. Further interrogation of the rear causes one to wonder: in what way does the boot open? I haven’t seen any images of the boot aperture in the open position. The sock-drawer concept as used in 2002 Lincoln Continental would not be appropriate for a car of this size. Does the rear screen open? Who can say. So, did Bertone fudge this? At the front end, notice the elegant way the headlamp recesses relate to the main surface. It looks as if the main surface has been cut and simply folded inward along the vertical dotted axes I have marked out. That is very efficient or sculpturally economical. The leading edge of the bonnet links the two recesses so uniting form and function. Hanging under that line we see a grille, in the Saab manner. That’s formally correct and also a good reference to Saab design characteristics. The engine’s presence has been signified by the use of a different colour paint treatment aligned graphically to the grille. And, I suspect, there is fudge here too. How does one access the engine? 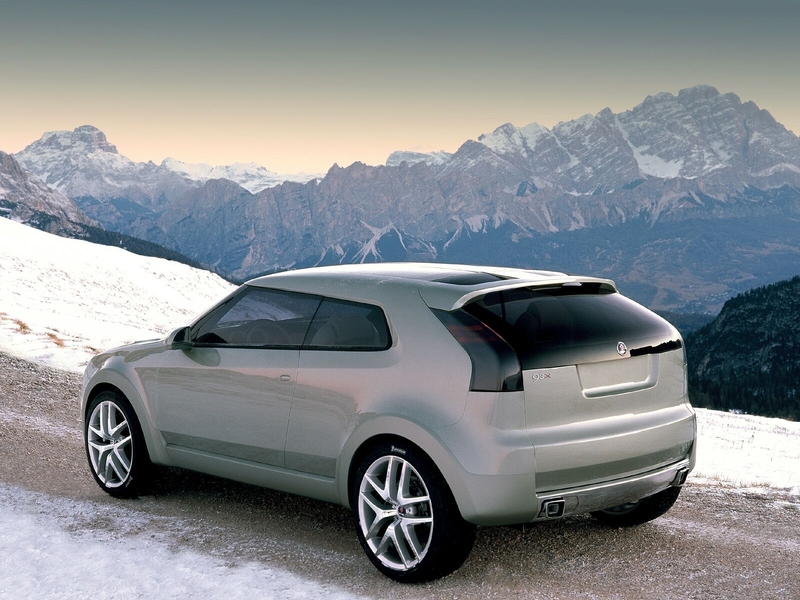 The same year, Saab showed the 9-3X (above), their take on a smaller vehicle. It shares the Novanta’s cantilever-effect windscreen and rising waistline. It has a longer bonnet though and the C-pillar, lamps and rear are a lot less well sorted out in comparison to the Novanto. Saab closed (I think) in 2012. Bertone closed in 2014. Saab Planet on the sale of the show car. Techshopmag on the SKF drive-by-wire controls. Is it a saloon or hatchback? Geneva show images. I’m pretty sure that the Infiniti Q50 had drive by wire steering which I think has been replaced with conventional steering due to market resistance. Yes and no. Yes because it did have steer by wire but if you look at the engineering diagram of the car there is still a steering column. For that reason (among others, I suppose) the dashboard looks exacly as a conventional dash would look. Still, full marks for finding an application, however qualified it turns out to be. Q50 still has it – Version 2 came out for the 2018 model year. What does the steering column have to do with it, other than it’s used for backup in the event of electronic failure? And to keep the punters from freaking out about robots taking over one supposes. Rather arbitrary “qualification”. You made this unequivocal statement: “it went nowhere – drive-by-wire is still a pipe-dream.” Incorrect. The SAAB 9-3X concept looks rather tame compared to the Novanta, but I can’t help liking it for the way its smooth flanks and strong shoulder line sweep up into the C-pillar and, especially, the “visor” treatment of the DLO. The rear aspect is rather less well resolved. I don’t like the step between the bottom of the tail lights and the tailgate glass. I do, however like the very deep two-piece tailgate for its practicality. Overall, though, this is a proto-“crossover coupe” that is far nicer looking than those currently on the market. It was just fifteen years too early for the market. Is it the very sharp corners on the lower lamps that upset the most`? That´s a form of visual noise and not in keeping with way other corners are handled. The Bertone car has smooth flanks, and visor-style screen too. It is much less resolved from production point of view whereas the Novanta is more obviously less worked out that way. It could have been and should have been. I don´t mind detail work being left but in principle a car design needs to be makeable otherwise it has not really been designed. I think perhaps the angular base of the tail light, its swept up shape and the stepped treatment is to ‘lift’ the car up at the back. There seems to be a theme going on with the rising window line and the way it all kicks up further back. This 9.3X reminds me of Audi’s Steppenwolf concept a little bit. This is a nice article exploring its desIgn. I’m not too keen on that concept as a Saab. I think some of the details are well done as Richard pointed out but overall I think it lacked a little in Saabness. The Saab clues are all there but, I don’t know, maybe the ‘nordic’ feel in its design is missing ? Altough more conventional I think I preferred the 9.3x. The wheels could have gained another spoke to make them Saab-worthy 3-spoke wheels. Btw, My car colour is burned orange so I know I have a little DTW in me when I drive. The Nordic aspect is missing from the interior. However, if the colours were altered that might be corrected. The floating panel went on to inspire Volvo, perhaps? The exterior looks Saab to me. That’s it. I’ve put my finger on it. I think it the concept looks too friendly to be a Saab. It feels more french/italian (again, despite the Saab clues peppered all over) than Swedish overall. Our MINI is Volcanic Orange…yeh! That´s a good orange colour. I am puzzled by the Bertone car being too friendly. Is the colour getting in the way of the design? The sharp lower corners on the 9-3X concept’s tail lights were designed with the bumper shutlines in mind, I think, as they meet these very neatly, at both inboard and outboard edges, and continue a smooth line upwards. Had the light cluster lower edge coincided with the bottom of the tailgate glass, that would certainly improve matters. Further, if the outboard bottom corner of the tail lights was changed to a smooth curve, even a small-radius one, then the effect would be more harmonious. That, of course, complicates the junction with the outboard bumper shut line! There is, of course, a precedent for sharp-cornered tail lights in the geometric headlamp shape. 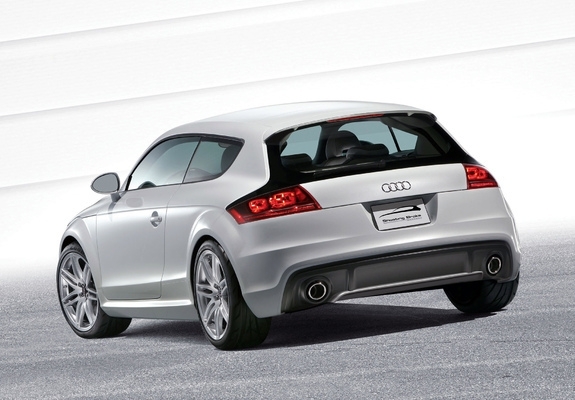 Maybe the best compromise is simply the levelling-up the lower edge of the tail lights and rear glass? Overall, a lovely looking car and an opportunity lost, IMHO. That Audi is more pleasant than the rear of the Scirocco to my eyes. It should teach us to slow down and how rules for everyone limit personal freedom but with a greater payback in terms of overall good. No rules means bigger crashes; sometimes an idiot will crash into you. Btw, I read earlier today that the concept went up for auction in 2015. We missed the opportunity to buy it. I couldn’t find how much it went for. Thing must be the worst Thing Bertone have ever glued together. perhaps I’ll go back to bed, my doors of perception must have moved. At least we can agree on the colour though. Sorry about the choking. I think out terms of service mean we have no liability regarding physical harm resultant from reading the site. We could usefully have a discussion about Bertone´s worst efforts. I expect one of the print magazines has already done a listicle on the topic. This car isn´t their worst. I think that the very aspects of it you hated were the ones I liked. Isn´t that fun? It is without doubt one of Bertone’s more… eccentric designs. What I find truly puzzling, though, is the extent to which the Novanta’s DLO has been replicated in the Mk1 RR Evoque (3 dr). It seems almost as a copy-paste exercise. Which explains a lot. The transitions between the C-pillar and the sides/rear are indeed very original, and if you squint you’ll probably see that the Novanta actually did inspire a few other cars down the line, not only the DLO of the Evoque “coupe”. Their idea with the radical deletion of the steering column is probably the most far-fetched cabin-passive-safety thinking we’ve ever seen, and conceptually does a lot to justify the Saab brand it carried. The B/W “dead behind” photograph exudes a certain ‘derriere superiority’ that, IMO, far exceeds the SAAB street-cred as a brand, and would be, perhaps, far more suited to a futuristic RR (not the R.Rover this time…) rear end. (I believe it was the active safety aspect that led them to use this signal-fluo hue…), it’d be a far more memorable and referred design. as is the range and subtlety of your thinking. and awareness for driver and occupants. something like a fifth generation Fiesta shine out as a reminder of design sanity. Addressing both Lorender and Al: what makes one of you dislike it and one of (I assume) approve may be its very inutility. Those small rear screens remind me of the way large luxos like the Buick Riviera and RR Silver Shadow had relatively (I stress relatively) small screens and had the scope for deep and secluding C-pillars. A luxury car can afford to be more useless than a family car and so signal the owner´s good fortune/skill/divine rights. Now I have thought through, a uselessly small rear screen makes no sense on a Saab which should be a useful car, good and useful. I still like the rear screen – it´s on the wrong car. The noise of a mind, changing. You know, the more I look at this car the less I think of Saab. For example, if you look at it from a rear 3/4 view there’s nothing at all that says Saab (is the unusually angled rear screen an hommage to the curved screen of the 900 though ?). Knowing the reputation Bertone carries on his shoulders on this site (and elsewhere I presume), would it be far-fetched to imagine this was in fact a proposal for, say, Daewoo, and somehow it became a Saab by carving out a pair of Saab-adjacent headlight and slapping a Saab grille on it ? In those days, Bertone had close ties with Opel/GM Europe, which would’ve influenced the choice of brand for the concept car. The Piatti/Biasio era at Bertone hardly ranks among the most successful (in any way) periods the carrozzeria went through. Once Marc Deschamps had left Caprie – for better or worse -, Bertone had lost not just its distinctive flair, but also any serious claims to being the most progressive among the carrozzieri. As of this evening I have all the ingredients for a Smokey Mizu: one shot of blended Scotch, two-thirds of a shot of Lillet Blanc and two-thirds of a shot of Suze (a gentian-flavoured liquor). Both of the liquors are 15% which lowes the ABV to under 30% and takes the rough-edge off the whiskey. The result is a soft cocktail with a complex sweetness – the Suze is behind that, adding a bitterness the Lillet lacks. You could get some of the same effect by simply blending whiskey and sweet vermouth; the Suze adds a dimension the vernouth would lack. Interestingly, the Suze tastes not unlike Aperol but is not red; it´s pale yellowy-green. If you wanted you could substitute Aperol for Suze but I would use less. Suze is much more subtle than Aperol (both feature gentian). Most useful from this is that if you want a more grown-up summer drink try mixing secco, soda water and Suze: 4 cl of Suze, 6 cl of prosecco and 2 cl of mineral water, plus an orange slice and some ice. I think you might be able to mix Suze and gin and dry vermouth for a dry martini with a twist. The bigger question is ” who is Dr Voss ?” You would think a man or woman of this calibre and with those qualifications wouldn’t have to resort to fixing drinks for thirsty bloggers.